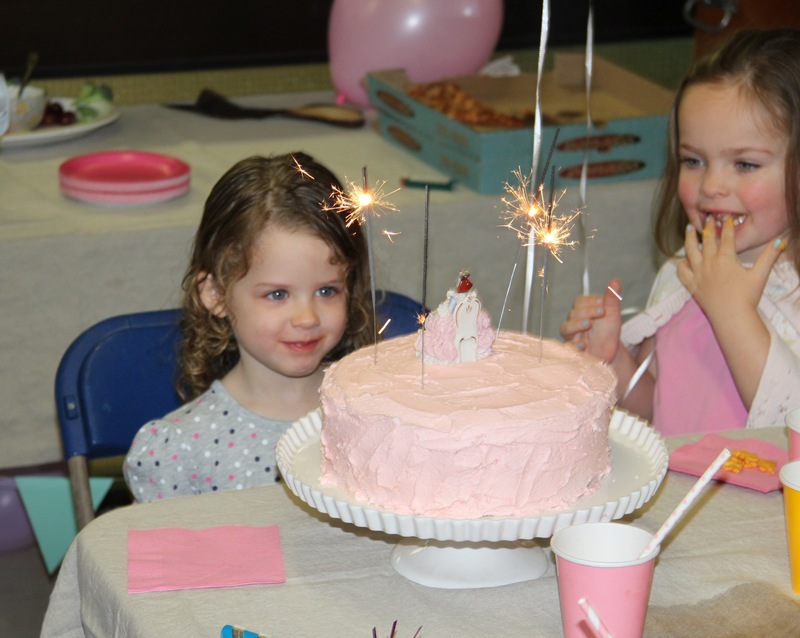 A pink cake, pizza, and a pool party – that’s how we celebrated J turning four on January 18. I have to tell you that I was a bit nervous about how many kids we had to cram into one teeny tiny room (I think the final headcount was seventeen little people). But having the children swim for an hour before we went to eat pizza couldn’t have been more perfect. The kids were so tuckered out and hungry that the party was nearly civilized. One of the best gifts was having J’ s best friend in attendance – back from Phoenix for a quick visit. 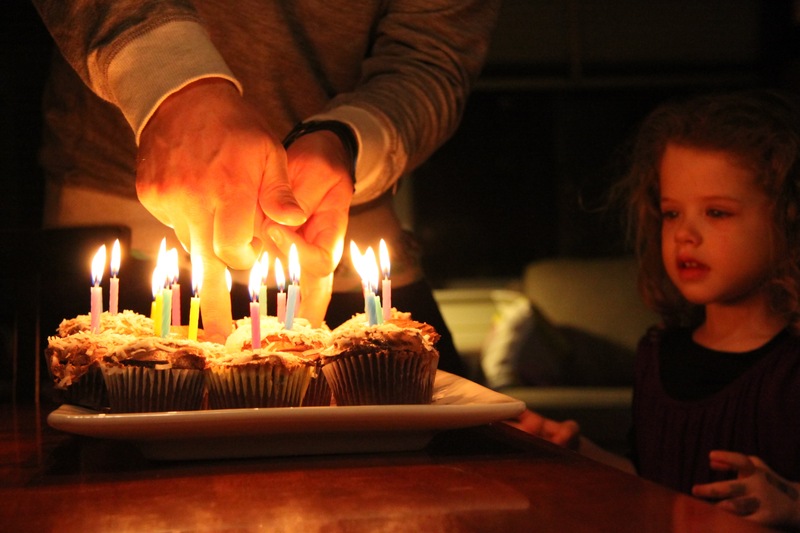 And even though they celebrated her unbirthday HERE, I know J couldn’t have been happier. I mentioned in this post HERE how much I loved our chalkboard. It really gets a lot of use around our place. 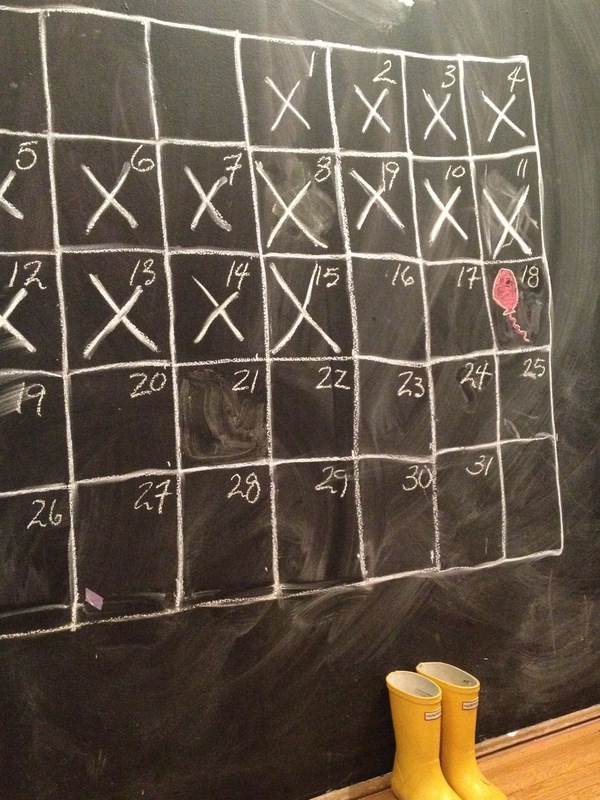 This month we used it as a countdown to J’s birthday. Time is such a weird concept for preschoolers, so we’re always looking for ways to make it easier for our preschooler to understand. J will sometimes wake up from afternoon naps and will ask if she can have breakfast. Remember how confusing it is when you sleep in the day? Sounds dreamy to me. p.s. check out these fun ideas using chalkboard paint! Fast forward to the following Friday when we hosted a little family dinner at our place. 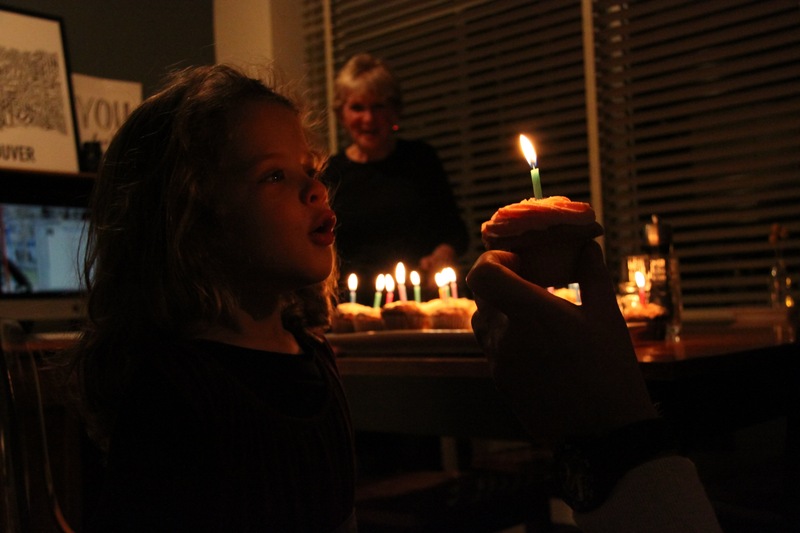 You know, birthday number three to celebrate turning four. Isn’t that how people do it these days? Party for the week, right? But the only thing is that we didn’t party for the week. A day and a half after her pool party J came down with a doozy of a flu and we pretty much stayed indoors for the rest of the week. I started poring over my surviving your preschooler handbook (thanks for that, Mom, it’s a goodie!) because we needed things to do to pass the time. Other than Netflix that is. And one can only play dollhouse for so long. So we baked, we made crafts, read book after book after book, and ate a lot of soup. Grandma came over one day with popsicles which have to be the best thing on earth for a little person with a fever and minimal appetite. By Friday night we thought things were coming around so we didn’t cancel the dinner party. Also, we figured that the poor kid had been cooped up with us all week and was probably dying for some new company. Sorry if anyone got sick after coming to our place! J put in a special request with her Great Grandma, she only wanted white cupcakes because the chocolate ones make her thirsty. Who doesn’t like chocolate cupcakes? I hate to wish a week away, but I am pretty happy that last week is over and tomorrow is (hopefully) a new day and germ-free day. P.S. here’s the recipe for the triple layer vanilla birthday cake that I made. Mine didn’t look that pretty but we think it was tasty. 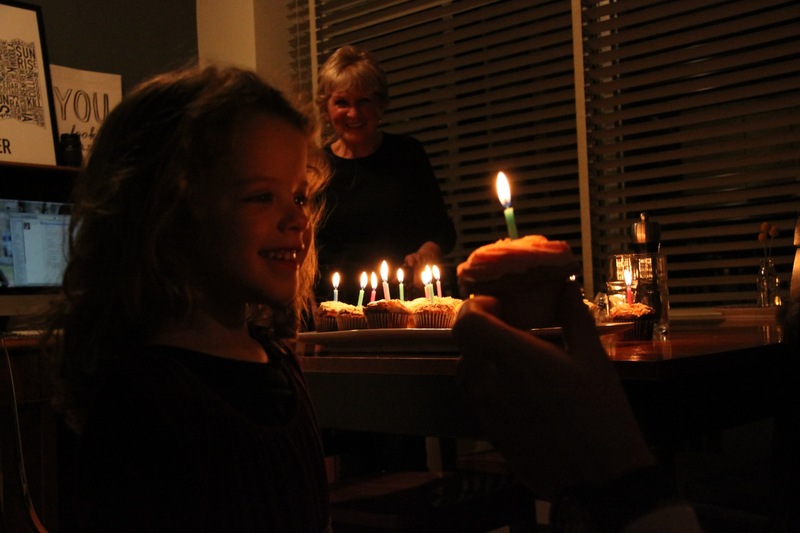 P.P.S Birthday number three, two and one and zero. It is so much fun watching the kids at this age. I know we have to take our 4 year old grandson to Chuckie Cheese Pizza on his birthday. Such an entertaining age, and Chuck E Cheese is always a good time, have fun! Thanks again for all the lovely posts. 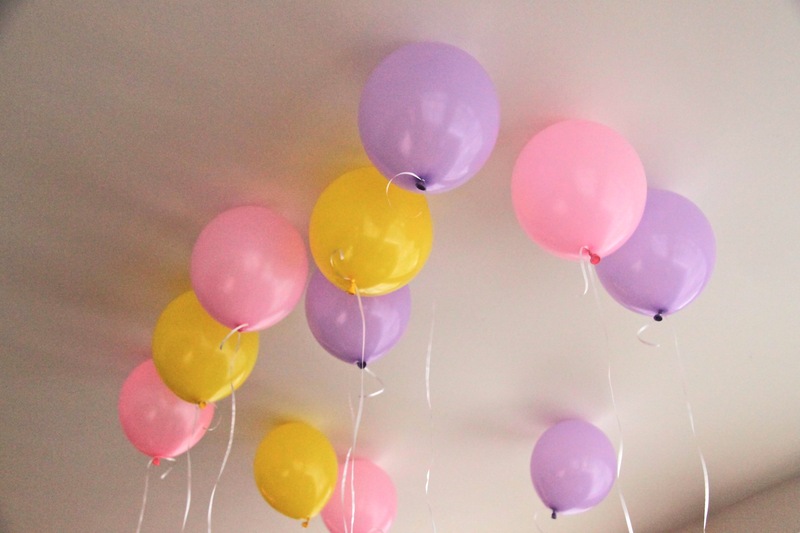 The party looked fun. I love all the chalkboard ideas too. I always liked my painted chalkboard inside my cupboard for ‘to do lists’ and my small chalkboard wall but your whole wall one has been great and does provide such wonderful and fun learning opportunities. I think I will expand a bit and at least try the placemats idea.